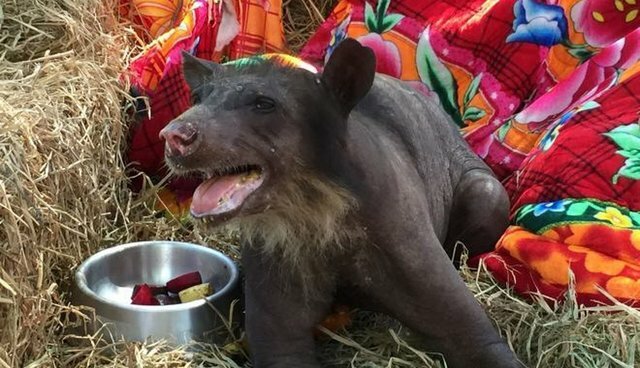 An endangered bear who suffered through years of abuse is finally on her way to a happy ending. 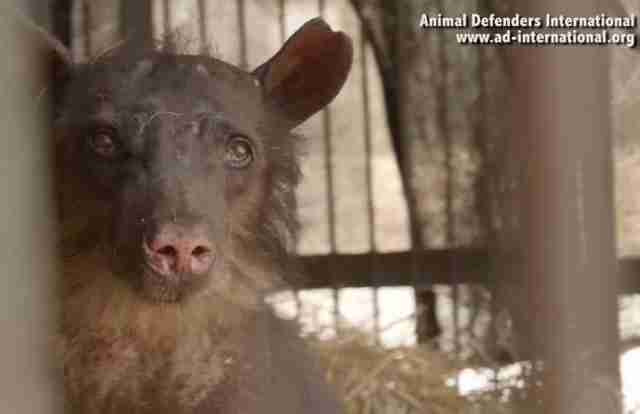 Cholita, a 25-year-old spectacled bear, spent most of her life in a Peruvian circus, living in a tiny cage and subjected to heartbreaking abuse. 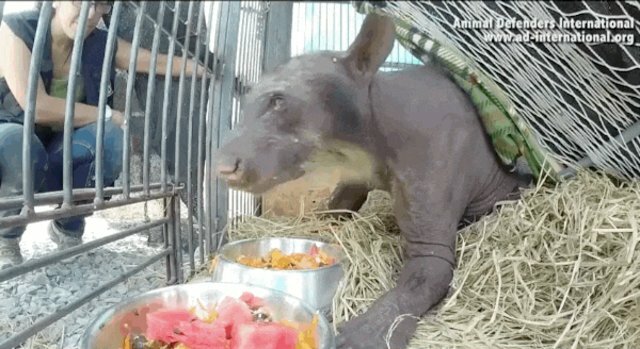 She was confiscated 10 years ago, and since then has lived in a Peruvian zoo because no proper home could be found for her. 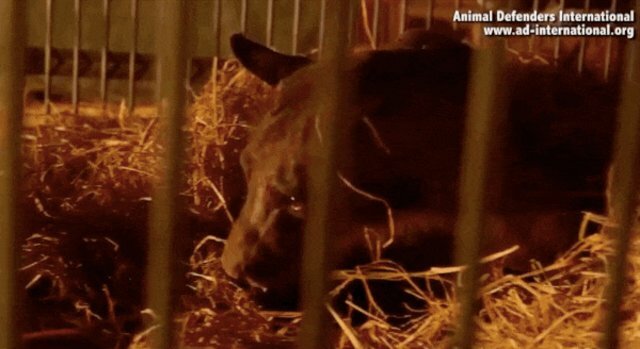 Jan Creamer, president of Animal Defenders International (ADI), unintentionally stumbled on the frail bear in March when ADI was organizing a seizure on a nearby circus. 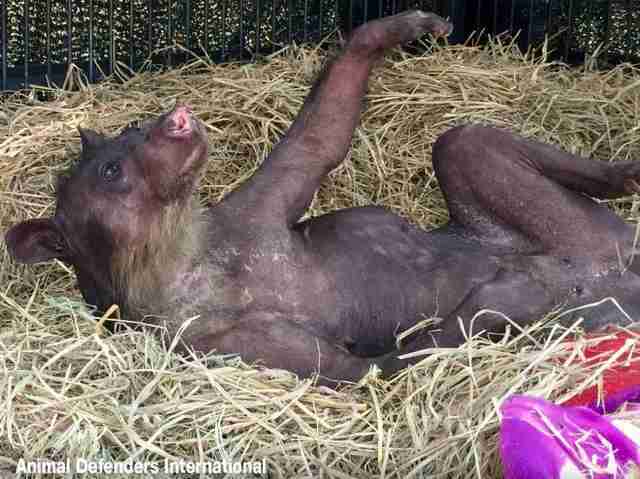 Zoo officials asked ADI to help find Cholita a better home, and since then ADI has been working towards securing her freedom. Last month, Cholita finally took the first step towards the life she deserves. 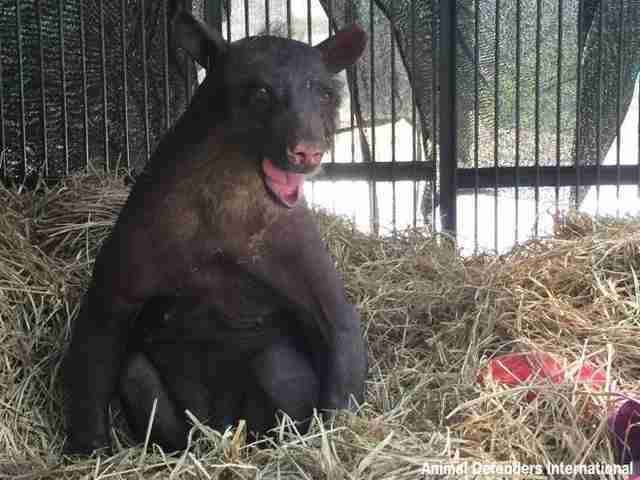 Video released by the group shows the gentle bear being moved to her new temporary home at ADI's Lima base. 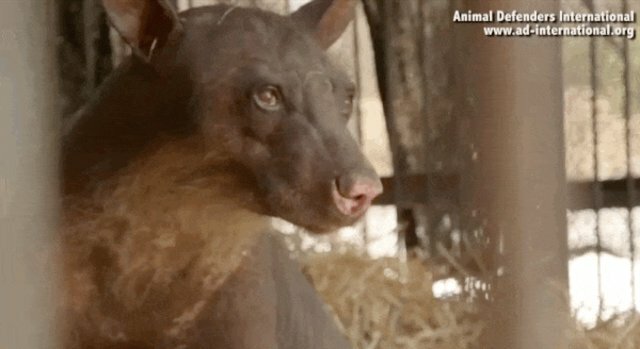 Unfortunately, Cholita still bears the brutal marks of her time in captivity. 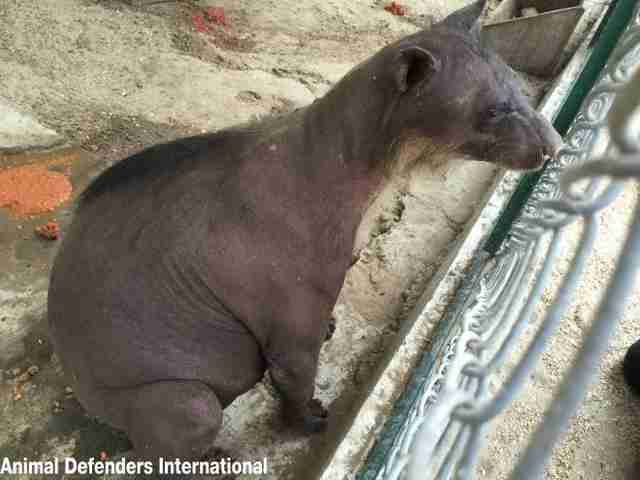 She's suffering from stress-related alopecia, leaving her almost completely bald. 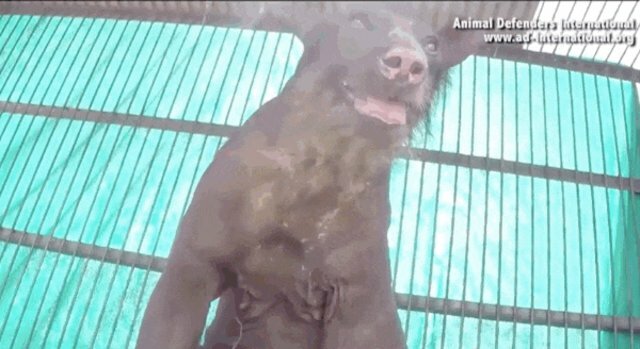 Her toes were cut off to remove her claws, leaving only stumps. 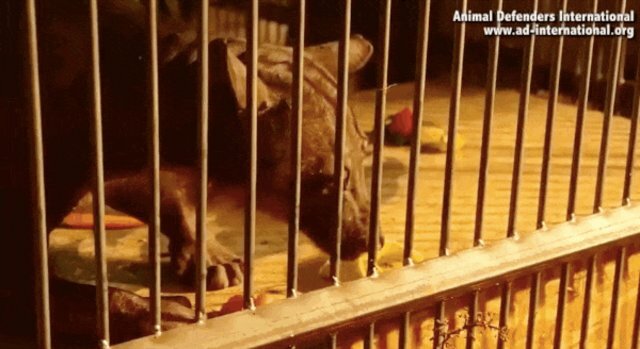 Her teeth were also broken, a common occurrence in captive predators, who are either bashed in the face when they misbehave or break their teeth by desperately trying to chew through the metal bars of their cages. 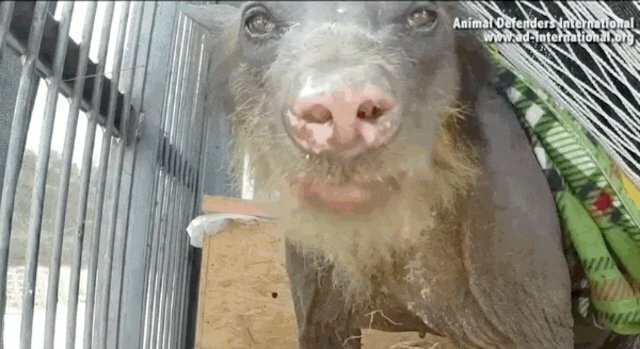 But despite all she's been through, the beautiful bear's sweet-natured personality shines through, as seen in her gentle interactions with her rescuers. 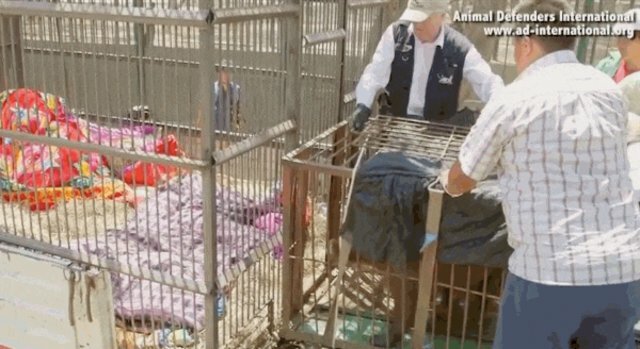 Rescuers use her tiny cage from the circus to move her to a travelling cage. Cholita can't wait to escape it, running into her temporary enclosure. 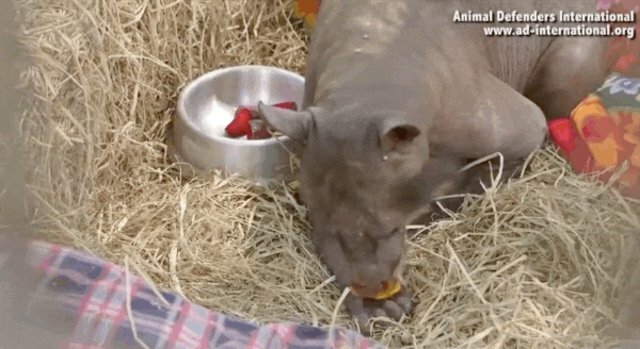 She quickly curls up on a blanket and helped herself to some snacks. 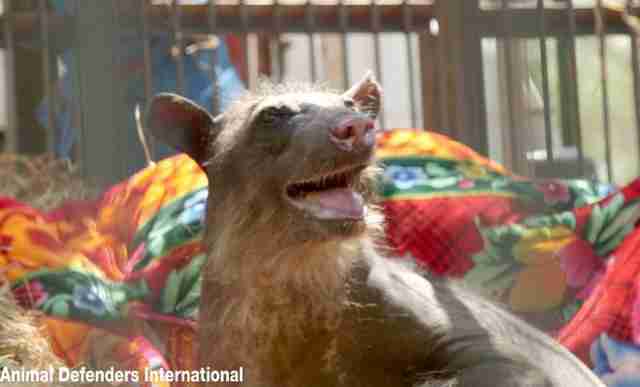 ... but rescuers keep Cholita happy by feeding her pieces of banana through the bars. 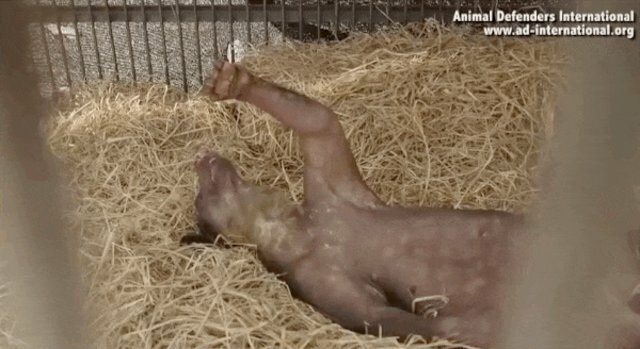 Already the gentle bear seems to know her luck has changed. And her rescue's just beginning. Next month, Cholita will be flown to Colorado's Wild Animal Sanctuary with dozens of lions and tigers rescued by ADI, where she'll be able to run free in acres of wide-open space.